FULL TIMEThe Demons have done it. Led by the new kid on the block, Kennedy-Harris, they have defeated the Tigers by 14 points in a much needed morale booster for the red and the blue. GOAL DEMONSHowe fumbles the ball forward, he takes the ball, runs into the goal square and kicks the sealer for the Dees. Pedersen fumbles the ball over the boundary as the umpire calls for a ball up. GOAL DEMONSKennedy-Harris runs to 30 and unloads a great running goal. The Dees are almost home. Kennedy-Harris is one excitement machine for the Demons! BEHIND TIGERSLloyd kicks from 40m out near the boundary, he comes in and it appears that the ball hit the post. A score review is requested and it is a confirmed point. With 3:30 left on the clock, the Dees fans are hoping that their team can hang onto the three point lead that they currently hold. BEHIND DEMONSThe ball comes off hands and through for a rushed behind for the Demons. GOAL TIGERSMiles gathers the free ball, has a shot on goal and he drills it. The Tigers make the Demons nervous, as they creep in to within three points. BEHIND TIGERSMartin marches it inside 50, lines up the goal and is just off target. The Tigers are trailing by eight points. GOAL DEMONSKennedy-Harris gathers the ball inside 50, has a shot on goal and kicks his second goal of the night. The Dees are leading by nine points. BEHIND DEMONSThe Demons go coast to coast as Bail takes a quick shot on goal but he is offline. 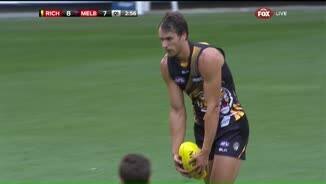 BEHIND TIGERSRichmond's danger man, Vickery gathers the ball, he snaps a shot on goal and he misses. GOAL DEMONSKennedy-Harris marks the ball 20m from goal on a slight angle. He slots it straight through the middle, keep an eye on that name, Dreamteamers! The Tigers have the momentum and look like they may run away with the game. GOAL TIGERSBatchelor intercepts a Melbourne pass in defence, he runs into 50, lets loose for goal and kicks his first goal ever in an AFL match. BEHIND TIGERSGriffiths marks 45m from goal, he takes the kick and misses away to the left. The Dees fans will be buoyed by this performance, with some fans starting to be convinced that a ten win season could be a possibility. BEHIND TIGERSMiles gathers it inside 50, has a shot at goal and is offline. GOAL TIGERSDeledio takes the spill of the ball from the ruck contest, kicks at goal and drills it. The Tigers are back within five points. GOAL DEMONSThe Demons are awarded a 50m penalty from the middle of the ground, after an interchange infringement by the Tigers. Spencer takes the kick from 45 and goals. We are back for the final term as the Tigers take it out of the middle. THREE QUARTER TIMEThe Demons go into the final break holding a five point lead over the Tigers. The Dees want a win, which will give a shot in the arm for membership sales if they can do it. GOAL DEMONSBail manages to take possession of the ball, he threads the eye of the needle and he kicks the goal. Vision is shown in the rooms with Newman strutting around confidently. It is a good sign for the Tigers. BEHIND TIGERSLloyd marks 40m from goal, near the boundary. He takes the set shot on goal and squeezes it through for a point. The Demons are desperate to go into the final break with the lead, they have enough time to pull it off. Bad news for the Tigers, as Newman comes down after a leap in the air. He looks to have hyper extended his right knee. 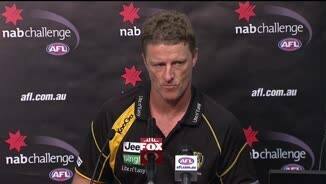 There will be some nervous times for the Tiges. BEHIND DEMONSToumpas passes it off to Bail who marks 30m out directly in front. He shanks the shot on goal and will have to be contempt with a point. Michie passes it off to Toumpas, who gives the Tigers the impression that he will have the shot from about 60m out. BEHIND TIGERSAaron Edwards comes out and takes the mark 35m from goal. He hooks it away to the right for a point. He hasn't got his kicking boots on tonight, the former Roo. GOAL DEMONSFrom the ruck contest, the ball spills into the hands of King, who slams the ball onto his boot and threads it through. Scores are level. The Demons are using a different game plan than they had from last year. It looks like an absolute winner too. BEHIND TIGERSAaron Edwards takes a diving mark at the top of the goal square. He kicks from an acute angle and misses away to the right. This game is in the balance at the moment, with the next goal possibly able to dictate the trend of the game. Cross puts himself in head first and he is penalised as the AFL has put in a new rule to reduce the instances of players ducking into tackles. The Tigers are starting to get a bit more of the ball around the middle of the ground, which is only a dangerous sign for the Dees. GOAL TIGERSVickery gathers the ball near the goal square, he sizes up the goals and slips it through. GOAL DEMONSBlease takes on Martin, runs to 50, puts the ball under his arm and kicks a great running goal. The Dees are back in front. We are back for the second half, as Stephenson gets first hand on the ball, being activated for this final half. HALF TIMEAn entertaining first half of football, with the Demons looking very impressive, trailing by five points to the Tigers at the main break. GOAL DEMONSThe Dees go coast to coast as Howe gathers the ball inside 50, he sends it through the big sticks to keep the Demons within a goal of the Tigers. BEHIND TIGERSLennon roves the ball and has a shot at goal, leaving him imagining what could have been, had he kicked straighter. BEHIND TIGERSThe Tigers take it through the middle as Deledio takes it into 50. He sends the ball towards goal and it is only through for a point. GOAL TIGERSMiles is given another opportunity at goal and this time he does not let the Tigers down as he extends their margin to nine points. BEHIND TIGERSMiles takes a quick shot at goal, but he is offline and through it goes for a point. The Tigers have the momentum at the moment, as they look dangerous and are set to drift away from the Demons. 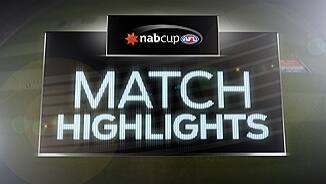 BEHIND TIGERSNewman takes it into 50, has a shot at goal and it drifts away to the right. The game is in the balance at the moment, with both teams throwing everything at each other. GOAL TIGERSJones is caught throwing the footy, inside the Tigers goal square. Newman is given the free kick and he kicks it through for an easy goal, handing the Tigers back the lead. GOAL DEMONSHowe roves the ball inside 50, he kicks around his body and he kicks a goal. The Demons are in front. GOAL DEMONSTrengove is taken high in the middle of the ground. 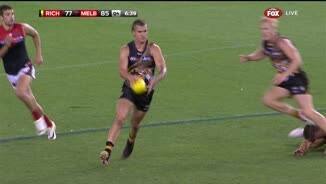 Rance kicks it away. 50m penalty has been awarded. He decides to take it inside 50 and he kicks truly. BEHIND TIGERSMcDonald punches it through for a rushed behind for the Tigers. SUPER GOAL DEMONSPedersen is infringed in the marking contest. He is given a free kick 55m from goal, he comes in and kicks a super goal. The Dees are back within a goal of the Tiges. GOAL TIGERSVickery takes a good mark 45m from goal. He takes the set shot on goal and he makes no mistake. The Tigers are back out to a 16 point lead. GOAL TIGERSAnother lapse in concentration for the Demons, as Vickery is unmarked in the goal square, takes a mark, plays on and goals. GOAL DEMONSBail takes the spill of the ball, puts his head down as he runs into 50, has a shot and kicks a goal. The Dees trail by four points. If the Demons were more accurate in front of goals, they would be leading this one by a mile. 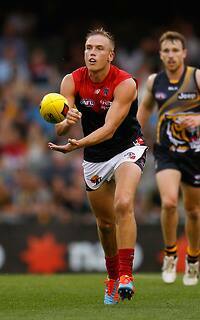 We are back for the second term, as the Dees have first use of the ball from the middle. QUARTER TIMEThe siren sounds to end the term and the Tigers go into the first break holding a 10 point lead over the Demons. GOAL DEMONSHowe marks it on the pocket, he hooks it around his body and threads it through. The Dees finally get their first goal on the board. GOAL TIGERSGrigg finds Deledio on his own inside 50. Poor marking by the Dees. He splits the middle as the Tigers surge ahead. They lead by 16 points. SUPER GOAL TIGERSMartin sets it up for Griffiths, who marks 55m from goal. The kick on goal is pin-point perfect and it is a super goal! BEHIND DEMONSHowe pops in and takes a regular human mark, disappointing by his lofty standards. He takes the shot on goal and he is off target. BEHIND DEMONSJones gathers it in the pocket, kicks around his body for his third point of the night. 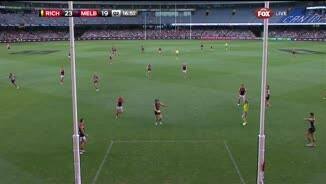 BEHIND TIGERSEllis presents himself as an option 35m from goal, directly in front, as he takes the mark. His shot on goal is disappointing, as he pulls it away to the left. Martin for the Tigers has had a bit of the ball, which would warm the hearts of all Tigers fans, after his contract drama in the off season. Paul Roos would be absolutely loving this display by KennedyHarris, he is an absolute ball magnet. KennedyHarris runs to 50, he has a shot on goal, he looks like he has missed the lot. The umpires deliberate asking for a review. The review confirms that the ball was out on the full. BEHIND DEMONSTerlich gathers it inside 50, he has a shot on goal and once again, the Demons add a point to their scoreline. The Demons will upset a couple of sides as the season moves on. They certainly have a spring about their step tonight. BEHIND DEMONSMorris jumps behind the pack and punches it through for a rushed behind for the Demons. They trail by three points. BEHIND TIGERSAaron Edwards runs with the flight of the ball, as he gathers it, props and puts it through for a point. BEHIND DEMONSJones marks it in the opposite pocket to where he had his last shot from. Once again, the newly promoted co-captain can only manage a point. 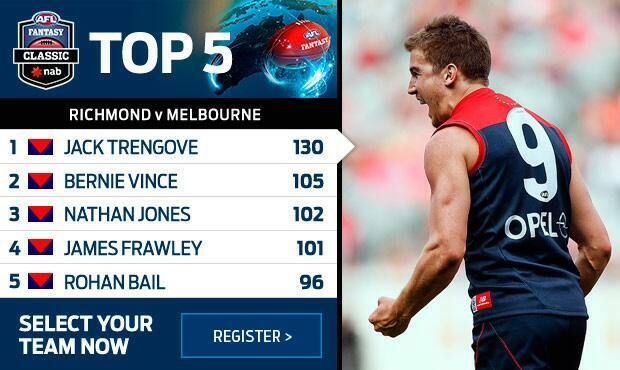 Melbourne already look a better and more competitive line up, with their additions to the midfield over the preseason. BEHIND DEMONSKennedy-Harris has a wild shot on goal and it goes through for a point. BEHIND DEMONSJones marks 45m from goal on a 45 degree angle, he takes the set shot on goal and is offline. GOAL TIGERSNewman marks it inside 50 with not much of an angle. He drills it, first blood to the Tigers. The ball is bounced in the middle and it is recalled as it heads into Richmond's half. We get a redo! Welcome to Etihad Stadium for the match between last years finalist Richmond and the much improved Melbourne team, coached for the first time by Paul Roos. This should be an interesting game. 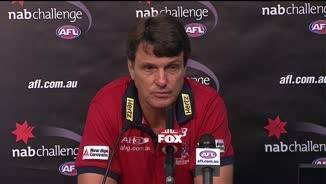 PAUL Roos warned Melbourne supporters earlier this month there was a "bumpy road" ahead but he also said the club was on the right track. He also promised his club was "up for the fight" as it worked to regain credibility after winning six games across the past two seasons. On Friday night against Richmond in a NAB Challenge clash at Etihad Stadium, the signs were there that Roos had already made an impact. The Demons won by 14 points, 1.13.11 (98) to 1.10.15 (84), in a thrilling finish with a seesawing final-quarter. More significantly than the result, the Demons just looked better. They ran hard, they fought at the contest, they stuck to a defensive structure when they needed to and they moved the ball with patience. They also had 445 disposals to the Tigers' 262. Of course, it was still a pre-season game. Jake Spencer kicked the ball into Tyrone Vickery at full-back, resulting in a goal. 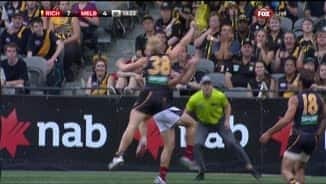 Alex Rance had an infamous "Alex Rance Moment" when he gave away a free kick to Jack Trengove, punted the ball down the boundary, and handed off a 50m penalty that also assured a goal. David Astbury dramatically cramped in the thigh as he was kicking in the dying stages, which delivered the ball to Melbourne revelation Jay Kennedy-Harris, who ran into goal to kick the sealer. The result came despite the absence of many of Melbourne's key position players. Mitch Clark, Max Gawn, Chris Dawes, Jesse Hogan, Mark Jamar and Jack Fitzpatrick were unavailable, and Jack Watts was a late omission. Jeremy Howe kicked four goals and provided spark. Nathan Jones set a strong example when he dragged down Ben Griffiths in the second quarter; a player 20cm taller than him. Kennedy-Harris shone. The dynamic first-year had a belter of a first half and then kicked three final-quarter goals. The Tigers, albeit without the likes of Jack Riewoldt (quad), Ivan Maric (ankle), Dylan Grimes (hamstring), Daniel Jackson (groin), Jake King (toe) and Ricky Petterd (calf), tried some things. They had a scare when Chris Newman, who played forward and kicked two goals including the first of the game, hobbled off with a right knee injury in the third quarter. Dustin Martin started at half-back and drove the ball through the middle, ran hard and snuck forward to create attacking options at times. Bachar Houli played on the wing, Brandon Ellis started in at the centre bounce and pushed forward and Steven Morris ran pretty much everywhere with his usual bull-at-a-gate attitude on show. Richmond: The Tigers missed a few players who should be available for next Saturday's clash with Collingwood in Wangaratta, and put in a typical pre-season game that had scrappy elements, an interchange infringement at the start of the fourth quarter and some missed opportunities. Still, they made a late charge and were within two points late in the fourth. Liam McBean finally got to see some senior action and Anthony Miles has done his chances of earning a nominated rookie spot no harm with an inspired performance. Melbourne: There's reason to believe Roos when he says things are heading the way they're meant to. Despite an abundance of key position players out, the Demons brought a new attitude to the game – one that demonstrated they were sick of being the competition's easy beats. While they'll no doubt encounter hurdles this season, at least there's evident cohesion within the group. Nathan Jones and Jack Grimes, who burst through the middle at one point to drive the ball inside 50, set strong examples as co-captains and Jack Trengove looks fitter than he has in a while. It will be interesting to see how they shape up with their key posts in the side but this – and their 115-to-91 contested ball victory – is a positive start. Richmond: Pitted against lightweights, Shaun Hampson did it pretty easy in the ruck and gave the midfielders first use in the half he played. Their first pick in last year's draft Ben Lennon started forward before he moved to half-back, and had some wonky early disposals before settling and collecting eight for the game. Former Greater Western Sydney midfielder Anthony Miles worked hard on the inside and led the Tigers for clearances and kicked an important final quarter goal while Sam Lloyd had a solid second half - a moment in the third when he spoiled strongly and a set shot that grazed the post with two minutes left. Melbourne: The brightest spark of the newbies was undoubtedly Jay Kennedy-Harris, who demanded attention every time he went near the ball with his speed, courage and creativity. He gave Steven Morris a run for his money. Daniel Cross did what he does – collect the ball and run all day, providing the Dees with a reliable ball winner, while Viv Michie had 19 touches and showed bravery at times. Bernie Vince went into the centre bounce and gave them some class with 32 disposals and a massive third quarter, and Dom Tyson was subbed out in the third quarter after 16 touches. Beanpole ruckman Max King looked raw but had a go, sneaking a goal from a stoppage in the third, and Alexis Georgiou showed composure and courage in the backline, taking nine marks.